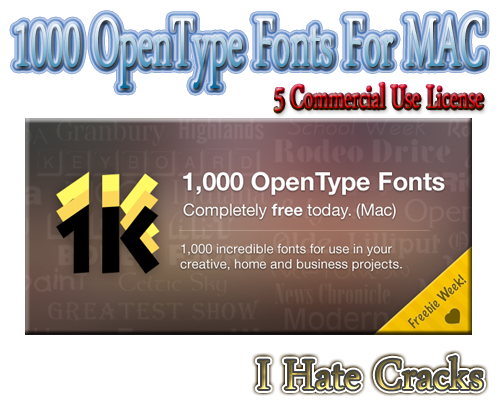 Today’s freebie is for MAC OS/PC users , especially for those who getting bored with default and old fashioned fonts . You can change the entire look of your MAC . Paddle.com presents 1,000 attractive and eye catching fonts . This cool fonts collection’s original value is $99 . You would have noticed that giveaway offers normally for personal use but the best thing is in this font collection is that you can use this freebie for both personal and commercial use . You will get 5 computer/laptop, commercial use license . Apart using it you personal MAC computer/laptop , you also can use it in graphic and logo design, web design, scrapbooks, presentations, invitations, promotional material, advertisements, and more . Personally I think it will ba a precious gift for web designers , graphic designers and logo designer etc . All fonts are royalty free . And as well as in this font collection , International character support is standard for nearly every font (barcode fonts and wingding fonts do not include international character support) . If you want to grab this cool font collection then you have 24 hours to get this free . Just visit the Giveaway page and follow the instructions .